I've been waiting a long time to review this game. In fact, it's nearly been 10 years since I first heard tale of Team Fortress 2. It was in September of 1999, less than six months after its predecessor, Team Fortress Classic, debuted as a Half-Life mod. TFC was a team- and class-based mulitplayer FPS based on QuakeWorld's Team Fortress mod. Valve, Half-Life's developers, had hired the TF mod team, who brought the game with them to Half-Life's engine. 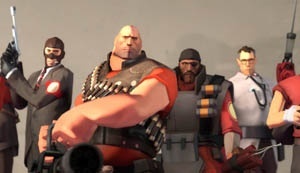 There were two teams competing against each other for either a flag or similar objective, and you could play nine different classes (Scout, Sniper, Spy, Medic, Heavy Weapons Specialist, Demolition Man, Engineer or Pyrotechnics Guy). The game was great because it managed to balance all nine classes reasonably well, lent the teams a bit of direction with the different flags, had some really great maps and, unlike Counter-Strike, which came later, didn't take itself too seriously. It was unpretentious and well put together. TFC will forever hold a special place in my heart. While Ultima Online and Diablo got me into online gaming, TFC made me a fanatic. I bought Half-Life (and never played it; why would I?) for TFC. I upgraded to a high-speed connection for TFC. I bought a computer with a dedicated 3-D card to sharpen its textures. I loved everything about it. I managed to get in on TFC's ground floor more by luck than anything else. It was July of '99. A buddy of mine had just downloaded it and wanted to show me how cool it was to play the Sniper class. Four hours later, I was inside Best Buy, looking for my very own copy of Half-Life, so I, too, could kill Scouts from 300 yards away. It wasn't but a few months later that I started hearing people on team chat mention a sequel. Valve was hard at work on a standalone game, which was supposedly due out any time. Of course, "any time" in gaming means anything but soon. Diablo 2 was three years in the making. I'm still waiting for StarCraft 2, the sequel to another game that sunk its teeth into me, and it's only now in production. But TF2 is in an entirely different class. TF2, first dreamed up in 1999, has been delayed more times than I want to count, to the point you could mention it with Duke Nukem Forever in the same breath. I've been waiting eight goddamn years to play this game. But the difference between TF2 and so many other continuations in a series is the game manages to take all the good parts from TFC - the classes, the humor, the goofy style, the balance -and then simplifies them without cheapening the experience. When I hopped into my first match, I didn't know what the hell I was doing. Everything on the surface was the same, but as I got deeper, everything felt new, but in a familiar way. It's like gaming deja vu; I'd been here before, and I knew the motions, but it was all foreign enough to be interesting.